Chop up the chicken (I used boiled, but you can grill it or use rotisserie too). Chop up the cucumber, onion, and celery into very small cubes and toss them with the chicken. Add a spoonful of mayo, the lemon juice and dill. Mix it in and add more mayo if you need too, adding a little at a time until desired moistness is reached. Add salt and pepper to taste. Hollow out the tomatoes like you're doing a jack-o-lantern. Cut a whole in the top with a knife, then scoop out the inside with a melon baller. 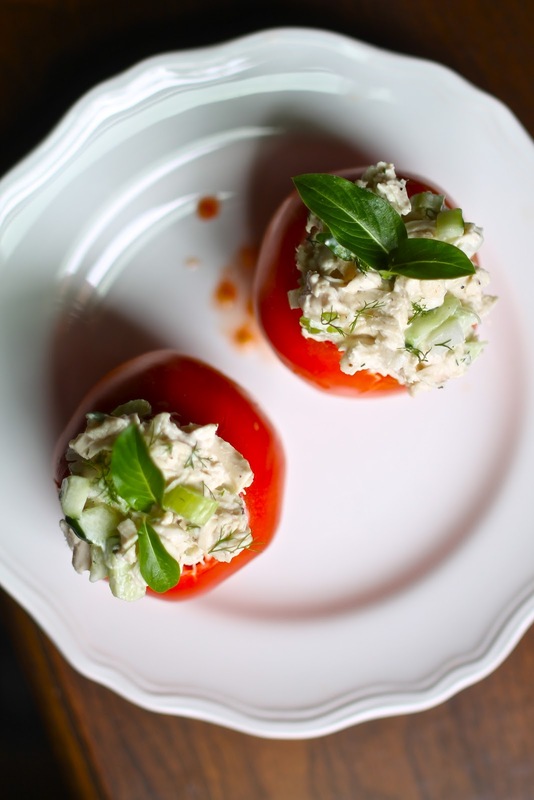 Fill tomatoes with chicken salad. Garnish with more dill or fresh basil leaves if desired.